If you’re like me, you’re totally tired of PowerPoints by this point in the semester (even though mine are far more engaging than your average PPT!). With topics like inflation, students have heard the term thrown around in History class and on the news for years. It’s one of those topics where they kind of already know what t is but are not quite sure. Well, I designed this lesson to combine their prior knowledge of inflation with their concrete understanding of how supply and demand work to help students figure out inflation on their own! 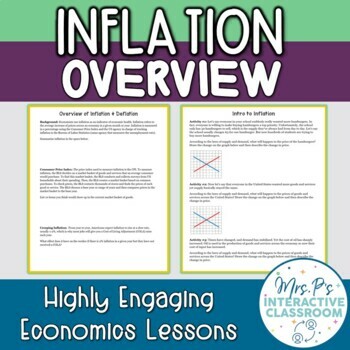 This lesson will teach your students all about inflation, hyperinflation, deflation, causes of inflation, and a basic understanding of CPI. For this lesson, students will first figure out what causes inflation in an engaging activity that uses prior knowledge and the laws of supply and demand. Then, they’ll read the official definitions of each term above and complete a critical thinking response.